If you are like most Eloqua marketers out there, you are using Google Analytics as one of your analytics tools. Serious marketers are gaining killer insights into customer behaviour, campaign impact and ROI by integrating Eloqua and Google Analytics. I’m going to give you 3 of my favourite techniques to get more from your Eloqua/Google Analytics integration from which our customers are seeing serious benefits. The url of each link will be appended with the additional information such as Type of Media (Email), Source of Media (Eloqua), Name of the Campaign (Eloqua Campaign Name) and Information about Content (Eloqua Email Name). UTM codes are bits of text you can add to a link that tell Google Analytics (as well as other analytics tools) a little bit more information about each link. 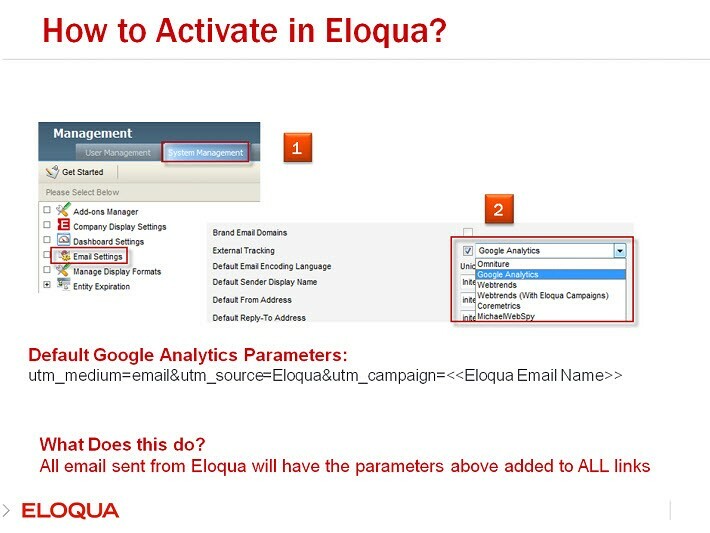 In Eloqua this is a one click integration. To set this up, navigate to the System Management area within Eloqua (1) and select from the drop down which analytics platform you want to pass parameters to (2). Wouldn’t it be cool to be able to see, by contact in Eloqua, whether a customer came from social media, an event or your email campaign and then be able to segment and target them within that particular channel? To do this add three new fields to the contact table that correspond to the source, medium, and campaign parameters that typically get passed from campaigns into Google Analytics (mentioned above). Next you will need to add the three text parameters to your form in Eloqua as hidden fields. Don’t forget to make sure your field mapping is correct in your ‘Update Contacts – With Form Data’ form processing step. The result? When a contact enters your site from YouTube, LinkedIn, an email campaign, an affiliate banner, or other, and submits a form, the source data will be passed back into Eloqua against the contact. This will in turn close the loop! Now you can get to work on reporting and segmenting on the most recent converting sources. Possible Gotcha: Clients consistently come across the issue of the campaign parameters being stripped off the URL string and therefore losing the ability to track visits or form submissions by campaign and source. This is normally due to Google Analytics not being properly configured for cross domain tracking or any 301/302 redirects that might be in place. Experiencing this issue? We can help you solve it. Ok so this is pretty handy, if you’re not excited by the title then you are dead from the proverbial marketing waist down! Google Analytics has a cool and handy data import function that allows you to import impressions, clicks, subject lines & cost data from your Eloqua campaigns directly into GA. This is accomplished manually via a CSV file or via the Eloqua API. Rather than me bore you with the details here you can check out the methods for yourself in the links below. If you get stuck we can give you some help and assistance getting this set up correctly as there are some little pitfalls and common mistakes made with this process that catch 99% of people out. 3.Send data from ANYWHERE into Google Analytics! Yep and we mean anywhere! Well almost. I’ve saved the best for last. The clever people at Google added a new feature with their last major update of GA called the measurement protocol. This feature allows developers to make HTTP requests to send raw user interaction data directly to Google Analytics servers as long as you have your GA account number and an internet connection. “Great Ryan but what does that mean?” I hear you say, well let’s take the following example. Your latest campaign is to promote an upcoming event. Your campaign runs, you drive delegates to register and on the day of your event lots of delegates attend your event. At your event you use an Eloqua integrated cloud event app like ‘DoubleDutch’ or ‘Attend’ as you mingle with your delegates. Or you have a point of sale terminal that is collecting attendee feedback surveys etc. Now wouldn’t it be cool to post back to Google Analytics and Eloqua a ‘conversion’ when a delegate completes a feedback survey or you use the event app to digitally acknowledge that you have spoken to the delegate face to face? Well now you can and once again close another loop. Of all the powerful things that you can do with Google analytics and ELQ this is one of the single best techniques you can use, and the possibilities are endless. So how is it done? Well obviously to execute this successfully is no trivial matter and requires developer knowledge as well as a hefty amount of testing, and I’m running over my blog word count already – but……if you want us to help you work thought the mechanics to get it working for you then feel free to give me a shout . That’s it for today folks, stay tuned for some more cool techniques about getting the best out of your Eloqua / marketing / analytics tools!